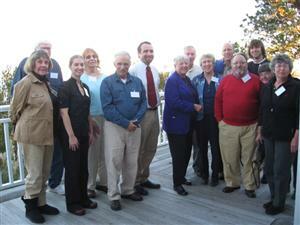 Volunteers are the lifeblood of the Harwich Conservation Trust (HCT). Volunteers maintain trails, enhance wildlife habitat, monitor bird nest boxes, assist in the office, work on citizen science projects, and engage in a myriad of unique and meaningful projects for HCT. Click the topics below to learn more. If you are interested in volunteering, then fill out the online Volunteer Interest Survey and we’ll follow-up to arrange a meeting at HCT’s office to discuss your interests. Learn about our many volunteer opportunities, and if interested, fill out an online “Volunteer Interest Survey” and click submit to help us learn how your interests can be matched with HCT’s needs. After we receive your survey, we’ll follow-up by email or phone to arrange a time at our office to discuss your interests. Explore several of the Citizen Science projects powered by HCT volunteers. See the ever-growing list of volunteers that make HCT possible. Learn about HCT’s ongoing partnership with AmeriCorps Cape Cod. HCT’s college and youth interns make a big difference while gaining hands-on experience.